Biltmore Property Group has retained The Woodmont Co. as the exclusive leasing representative for Western Plaza, a 200,000-square-foot complex in Knoxville, Tenn., and the Historic Biltmore Village, a multi-phased retail and mixed-use development in Asheville, N.C. Biltmore Property Group will also develop a 16,000-square-foot retail property within the Historic Biltmore Village at 19 Brook St. Located at 4315 Kingston Pike, Western Plaza comprises 150,000 square feet of retail and 50,000 square feet of office space. Biltmore Property Group is planning a major redevelopment of the Shops at Western Plaza including a complete renovation of the existing center and the addition of a 33,000-square-foot building with 20,000 square feet of Class A office space and 13,000 square feet of first-floor retail. In addition, a 21,000-square-foot anchor pad is planned at the southeast section of the property. Notable tenants at the retail center include The Fresh Market, Aveda Salon, Edward Jones and Jos. A. Bank. Situated in the Market/Trade Area within the Historic Biltmore Village district, the Biltmore Village development features shops including Talbots, Chico’s, Brooks Brothers and Lily Pulitzer. Senior Vice President John Geddis of The Woodmont Co. will spearhead marketing efforts at the properties including leasing at the planned building on Brook Street. “Each of these properties offers a unique opportunity to be located within a one of a kind retail destination,” said Geddis, in prepared remarks. “19 Brook Street in the Historic Biltmore Village is a rare opportunity for iconic retailers. 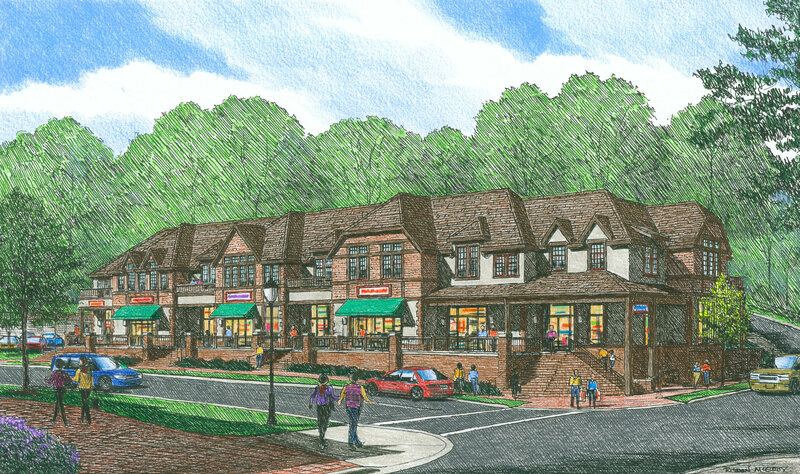 It is the last developable lot in all of Biltmore Village. Historic Biltmore Village is a popular tourist destination with 120 years of history and architecture, whereas Western Plaza is Knoxville’s premier lifestyle center,” he added.